Ever wanted to swing into the chic desert abodes of Frank Sinatra, Liz Taylor and Steve McQueen? How about reliving the fight scene in the James Bond thriller “Diamonds are Forever”? Then slip on those vintage slacks and take in the desert’s coolest international architecture gathering. 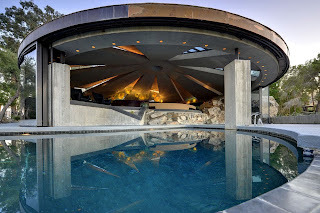 The Elrod House, seen in "Diamonds Are Forever"